I know you are staring at me. I’m the new kid. Everyone stares and whispers about the new kid. Even though I am a glorious member of the sixth decade club, whenever I am in a new place with new people I want to scrunch down and get super friendly in the corner behind Mr. Ficus. “But Midge,” pals say. “You will talk to anyone.” Yeah, but first I have to take a deep breath, say, wherever I am God is and all is well, and then give myself an actor’s objective. Damn, getting up the courage to talk takes a lot of stressful work. Work! That always works for me in a strange new situation – work. Around strangers I have to have a job – back to the actors objective – give me the antipasti to pass around and I can chat up a storm. Lightning bolts of panic zapped around my brain. Strangers in a new town, new country, faced with tons of new people to meet and they speak a different language. How will I meet them? How will I ward off boredom? I need a job! 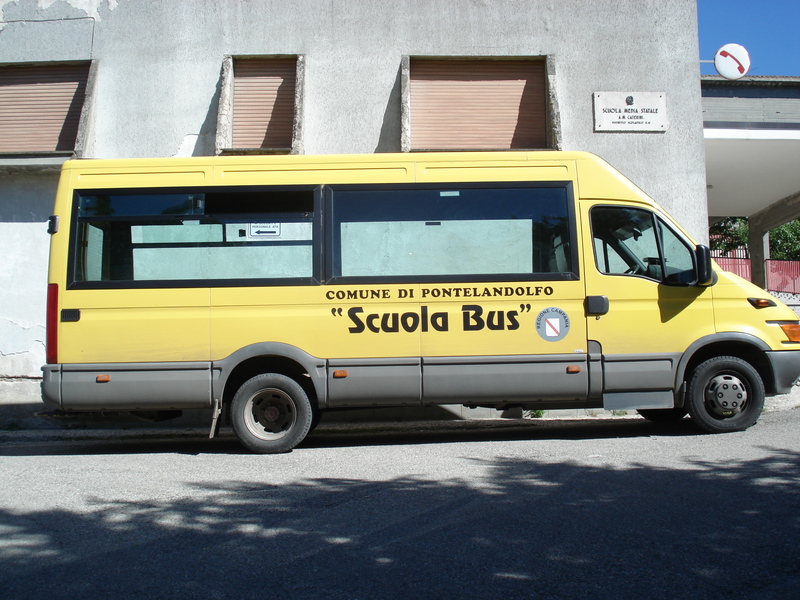 Before we got to Pontelandolfo, I asked our very own School Board Member (consigliere), Rosella Mancini about volunteering as “madre lingue” in the elementary school. The bus travels up the mountain collecting kids. Parents PAY if they want the bus to stop. 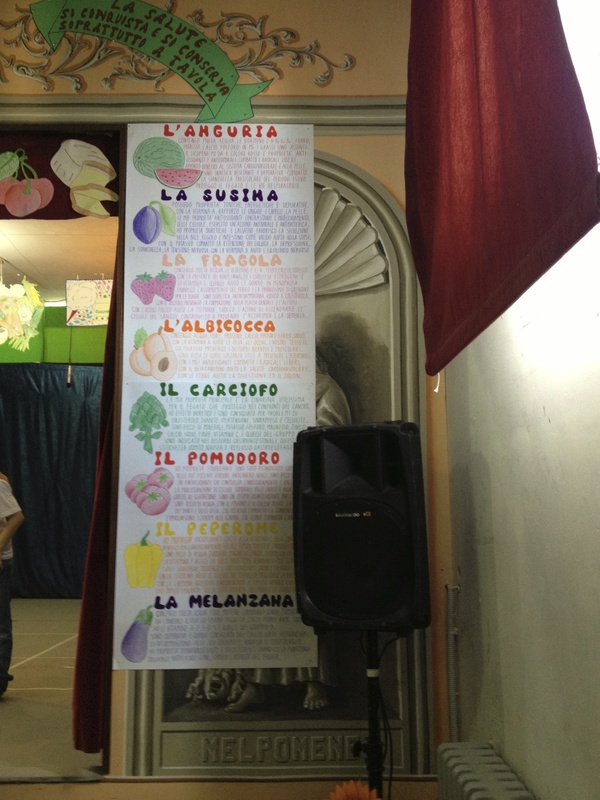 Starting in “scuola materna” – pre school – English is taught in the public schools. At the lower levels, it is the classroom teachers responsibility. I thought this act of kindness/selfishness would give me something exciting to do and I’d meet a bunch of great kids. 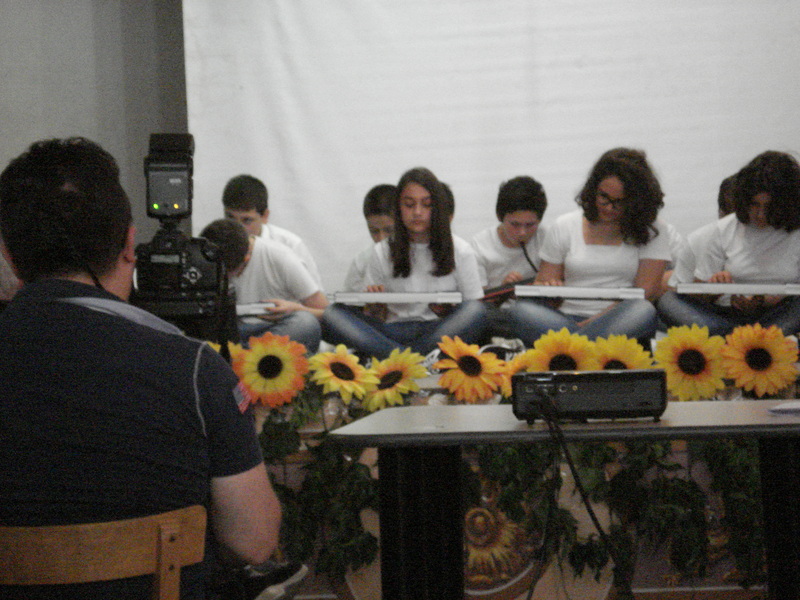 They were truly great kids – they stand when ever a teacher enters the room and say Buon Giorno. NO ONE is staring at their phone! Here’s a quick overview of the educational system – don’t worry I’ll toss in some pictures. Not the prettiest of buildings. Very 1950’s utilitarian. 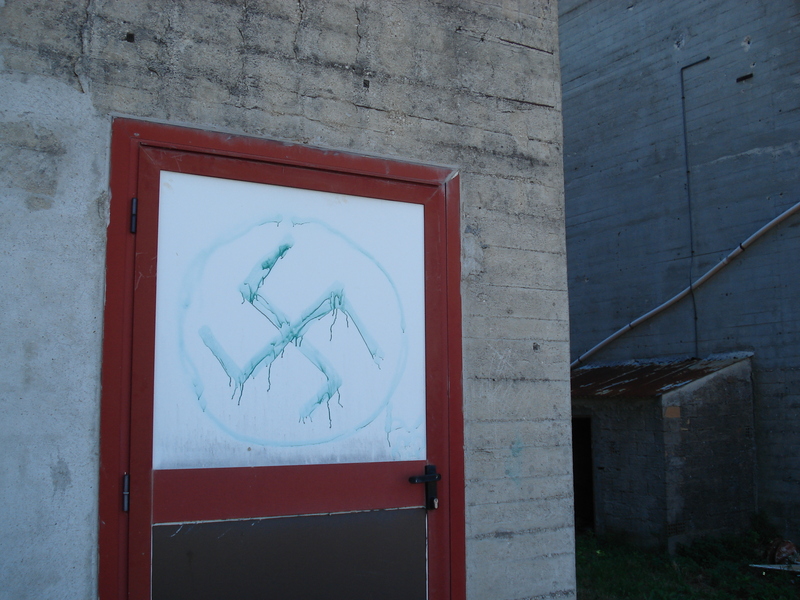 I wandered and found this on a back alley door. Yes, I reported it. Happier note – they get music and art in every grade. This is a piano keyboard class. Besides English they were studying French too. All children must stay in school until they are 16 -“Scuola del obligo”. Gossip from the teachers is that school directors don’t accept kids failing. If a teacher fails a child, it is the teacher who is the failure. Whoa – where does that put the responsibility? How many kids just “pass”? I gotta say I taught a good number of college students that graduated from high school and couldn’t write a sentence. Guess some practices are world wide. TA TA da dum – standardized tests are given by the Italian government during a students third level of la scuola media (students ages 11 to 14). Tests – another global initiative. 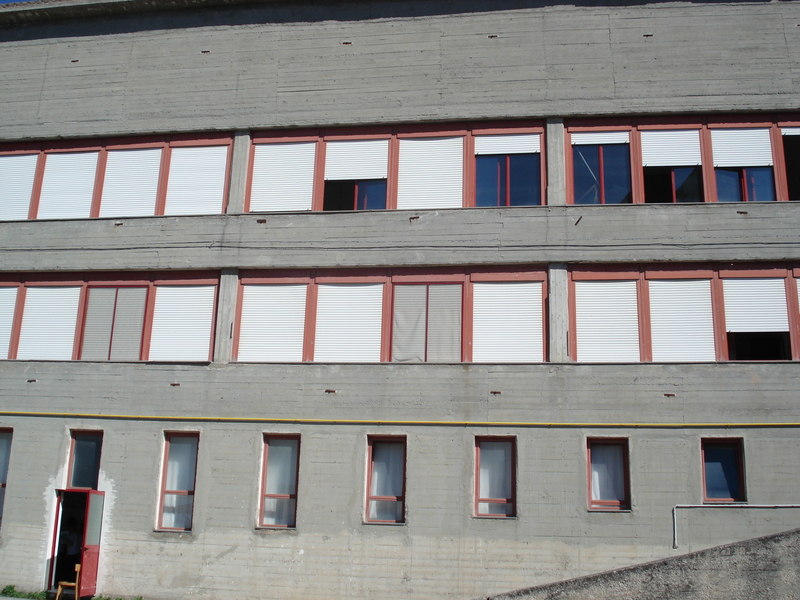 The primary school was condemned and now those students have a wing in la scuola media. Those attending una scuola dell’infanzia/materna, ages 3 to 5, and una scuola primaria/elementare, ages 6-10 get to wear un grembiulino. 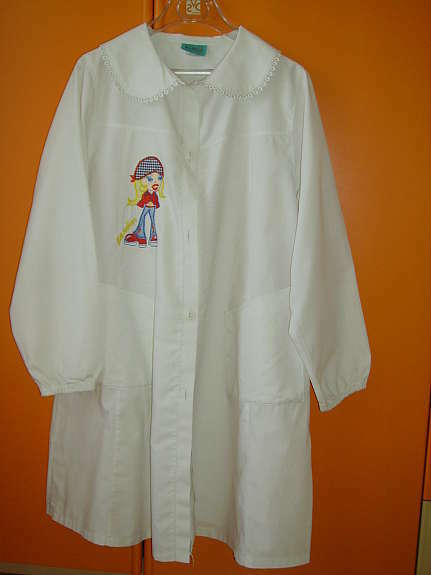 The smocks are adorable. Clean, cute and practical. Ours were blue. 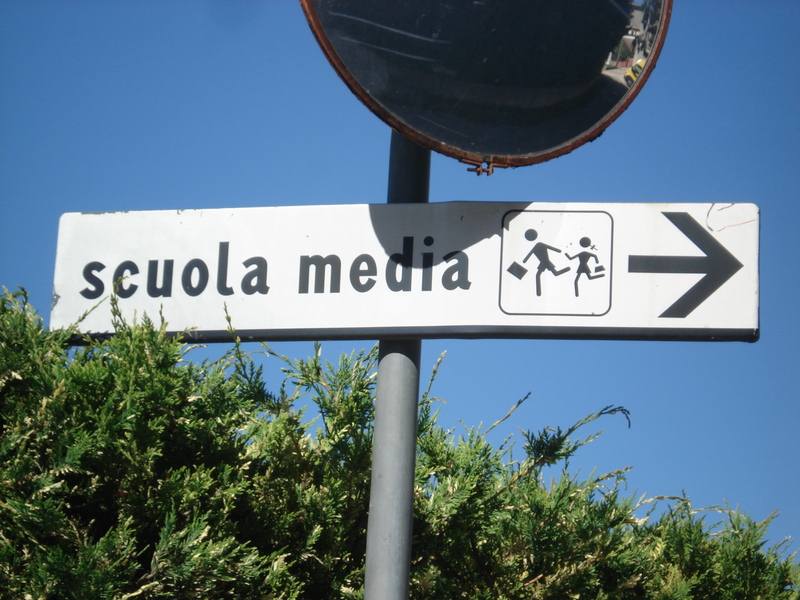 The “primaria/elementare” and “media” scuole classes I visited had classes of about 15 students – I am told that is the norm. i went to the end of year show – music, poetry, history – performed on a very small stage that had incredible art around the proscenium. 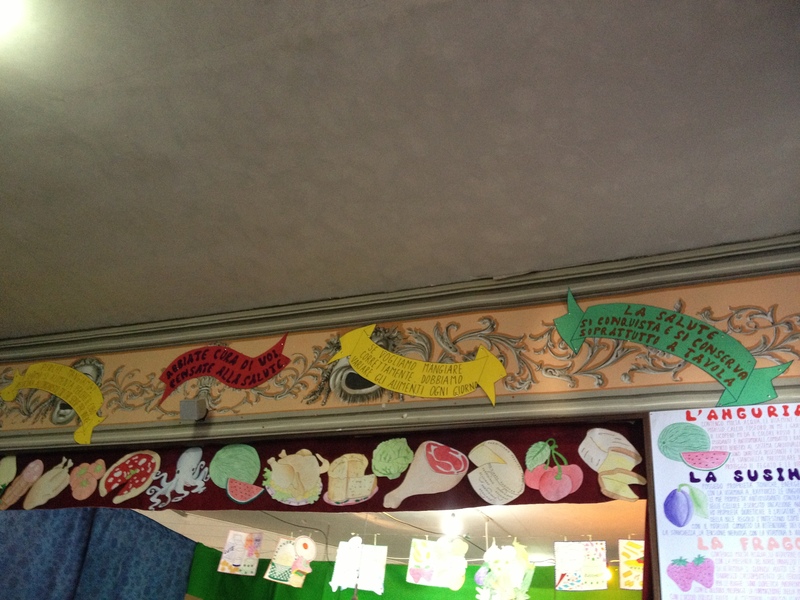 That great art was covered by pictures the teachers made of fruits and vegetables – REALLY. NOOOOO! Art Alert! Art Alert! Not all things are simply fabulous in Italy – the show was to start at 6:30 – it didn’t. Parents started lining up to go in at 6:00. The teachers didn’t open the bloody doors until almost 7:00 and people pushed in to get the limited seats. They need me to produce their end of year shows. 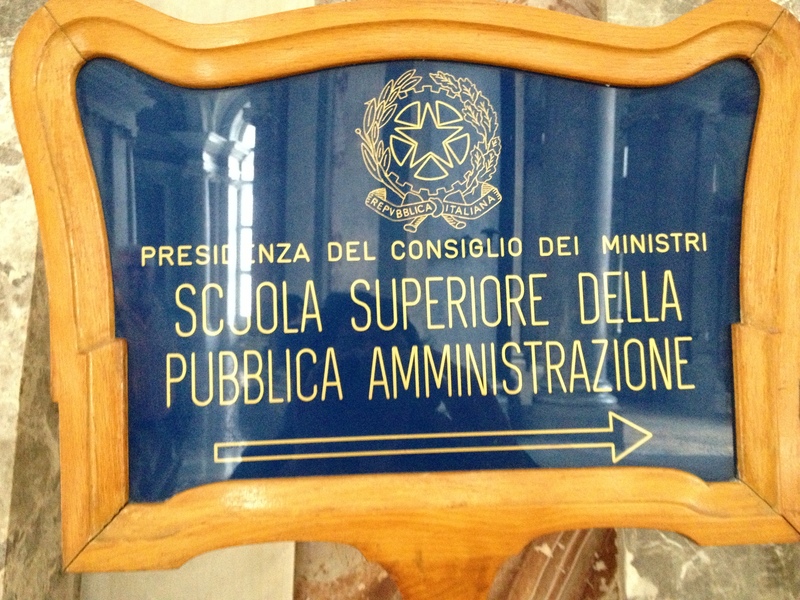 Secondary School for Public Administration! Do we have one of those? I think not. 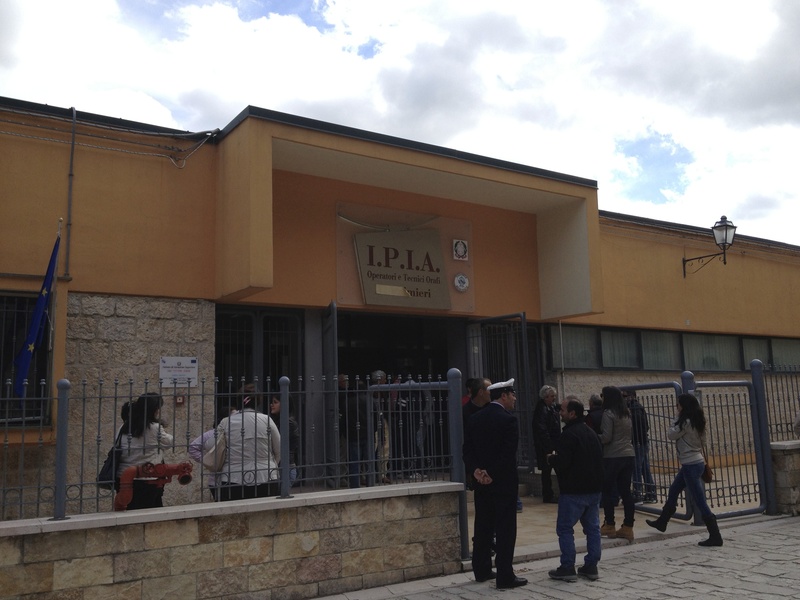 Secondary School located in Pontelandolfo – Art and Design of Gold Jewelry! Sadly, since there is not easy public transportation and enrollment is low the school will be closing. OK, back to me teaching. To arrange the volunteer commitment, Rossella and I met with the director of the district. I took one look at the head of the schools and could barely remember my memorized bio in Italian. Thank the stars for Rossella who did the commercial for me. My mind went blank. I was stifling huge guffaws – because this woman who deals with tween age boys all day had a blouse on that was cut so low her girls must have been freezing. Geeese Louise – dress for the job. Worse than not being able to speak was not being able to listen – though Jack says I am a chronic non-listener. I thought she said, “ how do you like Casalduni?” I said something like, yes, I like Casalduni (neighboring village). What she had said was, ” would I mind teaching there too! ” Not being totally fluent got me into tight binds often. Somehow we managed to ignore that request and just focus on the children in my home town. Day one approached. I had looked through all of English text books for the entire spectrum of grades – from ages 5 – 14. Gulp, they should know more English grammar than I was ever taught. The sweat was dripping off my brow as I created lesson plans for every grade – did I say every grade. Yes, I taught in every single classroom in the co-mingled primary and middle school. A little voice said – “teach what you know.” Kids and creative dramatics are perfect together. Whew, I should have thought of that sooner. Not bragging here – but since the classrooms are very traditionally taught and I ain’t traditional – the kids loved my classes. I started every class with one of the many name games I can pull out of that theatre trunk in my head. Of course to introduce myself, I did something silly and wondered about the gasps on my last name – Guerrera – until I heard all of their last names and heard a bunch of them say – Guerrera. Yikes, more branches on the mulberry tree to explore. Enough reading – time to go to the video. Previous postNapoli è una bella città – BUT DON’T DRIVE THERE! Midge,excellent blog. You were very brave to take on this challenge. What results though! What a wonderful idea! But it took guts, I’m sure. Kids are so honest; if they didn’t like it, you would have been toast. Congratulations. I guess creativity follows you wherever you; no matter the country! What a great blog! You need to know that I have enjoyed all your blogs this summer and was almost sorry that you had returned to the States. I hope that you have more adventures that you can share with us. So glad ypu are continuing the stories of Italy. I so enjoy them.